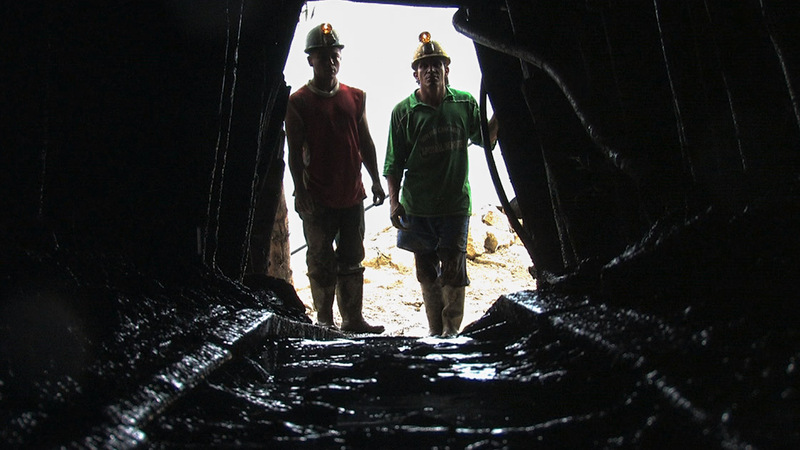 Next up in the US Documentary Competition: Mark Grieco’s MARMATO, in which a rural Colombian mining town is threatened with extinction by multinational development. Every day in Marmato, a shimmering Colombian mountain town, families pray for safety as their men walk out their doors and down into the mines, scratching out a living with little more than shovels and outdated sulphur lamps. Beneath their village lies one of the largest gold reserves on the planet. In 2006, the Colombian government invited foreign investment to the region to stimulate economic growth, unleashing a corporate gold rush. As plans progress to destroy residents’ homes and level the beautiful mountaintop for an open-pit mine, MARMATO charts the mounting crisis as the local community struggles to protect its way of life and economic sovereignty. In a documentary spanning six years, filmmaker Mark Grieco’s acutely perceptive camera captures the villagers’ multiple survival tactics as a family man turns to mining illegally, an elderly mine owner waits to sell to outsiders for the right price, and an activist leads increasingly tense protests. The result is a gripping, breathtaking, intimate portrait of resistance and a community bravely teetering on the precipice of change. Earlier this year, Grieco received a Sundance Documentary Film Grant for this project, his feature debut, as well as support from other notable funders, including Cinereach, BRITDOC, and the MacArthur Foundation. Joining him as producer is Canadian film executive Stuart Reid, who was an associate producer on BLACKBIRD, a winner at Toronto last year. Both of the film’s executive producers are Sundance alums: Mark Achbar directed THE CORPORATION (2004, Audience Award winner), while Peter Starr produced MANUFACTURED LANDSCAPES (2007). I previously profiled the project during its Kickstarter campaign. Grieco’s film captures a rich sense of place, reflecting the filmmaker’s immersion for several years in the community. This familiarity enables surprisingly intimate access to his subjects’ lives and work, hopes and fears, from their modest homes to the dark and foreboding mines in which they spend their days, and even sensitive and tension-filled encounters with representatives from the Canadian mining conglomerate which threatens their futures. An exploration of the intersection of economic development, environmental impact, and globalization in a microcosm, perhaps the film’s greatest strength is in its humanism, unflinchingly siding with the local community in its struggle to maintain their homes and way of life. For more information, visit the film’s in-progress Facebook page. Check out Grieco’s Indiewire filmmaker interview. Should it become available, I’ll also link to his Meet the Artist Sundance video profile. For screening dates and times at Sundance, click the link in the first paragraph.